We called him “Mick the Quick.” He was born in Miami, FL on October 31, 1948. 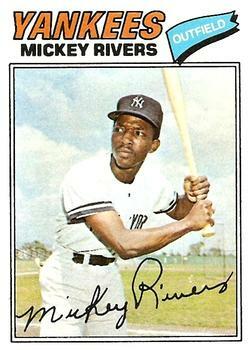 Rivers came to the Yankees with Ed Figueroa from the Angels in a December, 1975 trade for Bobby Bonds. That deal was the key that finally fully opened the door to the resurgence of the Yankee dynasty, which took place in the mid seventies. Figueroa was himself a big part of that resurgence, winning more games during his first three seasons in Pinstripes than any other AL pitcher. But it was Rivers who provided the missing piece to the Yankee’s offense and during his first two seasons in New York he was one of the most exciting players in baseball. with most of the rest of the Yankee lineup in that season’s Fall Classic versus the Reds. 1977 brought more of the same from Rivers. He again sat out two dozen games but his regular-season average climbed to .326. Just as importantly, Mickey played a very good center field for the Yankees, using his speed to get to balls quickly, which more than compensated for his just OK arm. He hit over .390 that year against the Royals in the playoffs and the Yankees won their first World Championship in 15 years. I saw Rivers up close just one time. We were at Yankee Stadium for an Old Timers game, standing behind the police barricades by the Stadium’s player entrance hoping to catch a glimpse of all the past and present Yankees arriving for that day’s games. Rivers pulled into the Yankee parking lot in a beautiful car. I believe it was a Mercedes. What I’ll never forget is how slowly the guy walked. I think it took him ten minutes to cover the hundred feet between the gate of the parking lot to the player’s entrance to the Stadium. I remember another Yankee player, I believe it was Bucky Dent, pulled into the parking lot a full five minutes after Mickey did that day and got inside the stadium before Rivers did. I remember wondering how any human being who moved as slow as Rivers did could possibly lead the American League in stolen bases, which Mickey had done in 1975. By 1978, however, Mick’s on-the-field performance began to suffer. His run production decreased and his batting average dipped by sixty percentage points. He also seemed to be growing a bit more nonchalant on the bases and in the outfield. Remember, this was the height of the Billy Martin era. The boozing and mercurial Yankee skipper had lost the reins of his team and the New York Media was having a field day with all of the controversy. Rivers enjoyed the New York nightlife and the ponies. He needed to be kept on a short leash but with the Yankee dugout a circus, there was no one to hold the other end of that leash. My favorite off-the-field story about Rivers was when he pulled into the Yankee Stadium players’ parking lot before a game after an overnight spent enjoying the Big Apple night life. Allegedly, Mrs. Rivers happened to be laying in wait for her husband in the same parking lot. She proceeded to use her late model luxury car as a battering ram, repeatedly crashing into the Mick’s own late-model luxury car. God I wish I’d been there to see it. Mickey’s gambling and philandering was also taking a toll on his personal finances. Rumor had it that George Steinbrenner was growing very angry with his center-fielder’s constant requests for salary advances and increases. By 1979 the Yankees had grown weary of Rivers’ behavior on and off the field and they traded him to Texas to reacquire Oscar Gamble. I still miss the guy. Rivers shares his October 31st birthday with this former Yankee catcher, this former Yankee infielder and this other former Yankee infielder.